The ferias are just magic and unique, because they bring a touch of Spanish and French Southern cultures within the same festival! The list of things to do during the Feria is very long, and you will certainly not have the time to do and see everything. Here you will find a selection of what in my opinion are the best things to do during the Ferias. 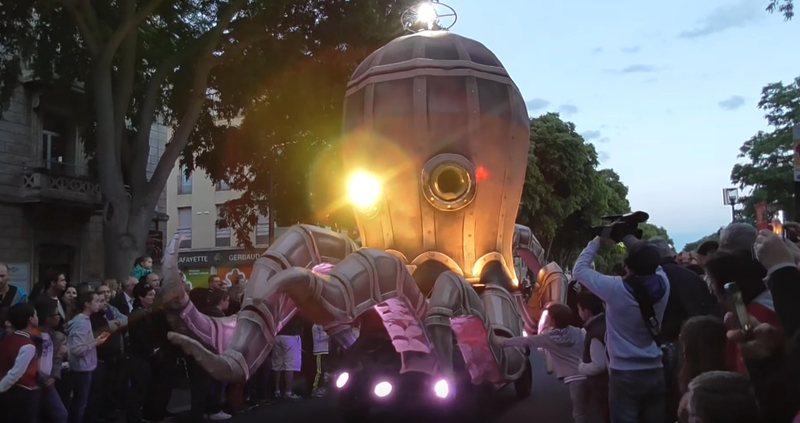 Pegoulade: The Feria de Pentecôte start on Thursday with a procession where a giant serpent is made with performing dancers, acrobats and marching bands, illuminated while they make their way through dancing in the music and the talented singers mesmerizing the crowd with their songs. 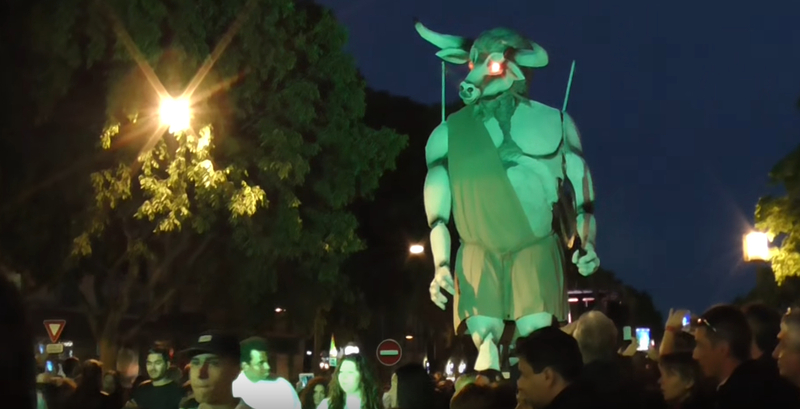 This procession, that we can also call a parade, is locally called “Pegoulade” and proceeds within the streets of Nîmes throughout the day till the dark of the night. A crocodile (symbol of the city of Nîmes) is always parading at the end of the procession. 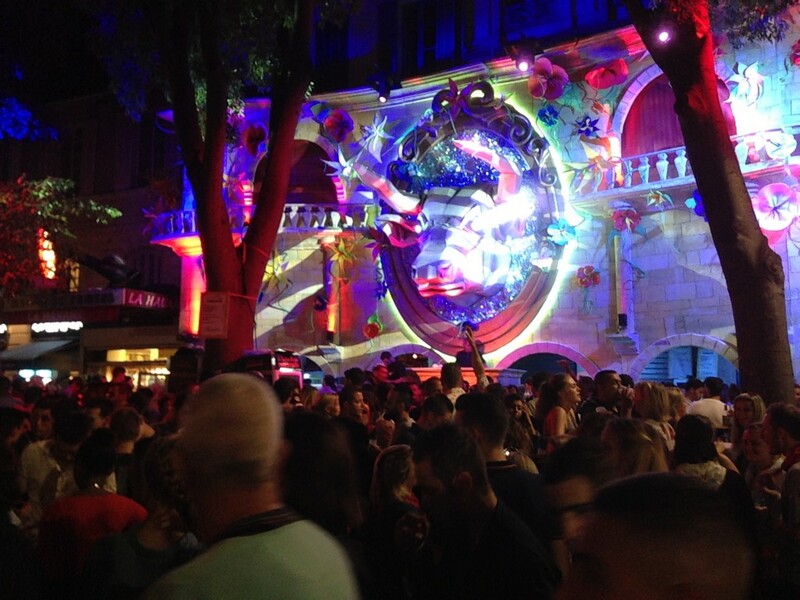 Regarding the times, the Pegoulade parade traditionally start around 8.30pm and end up at 11pm. Every year the themes are different, for example: 2016 Mysticism and Legends, 2017 UNESCO world heritage sites… The procession usually goes throughout the big avenues of the city and the route may change a little bit from a year to another. If you plan to go to the Pegoulade, try to get a place of choice along one of the main avenues, usually Boulevard Amiral Courbet, boulevard Gambetta and sometimes Avenue Jean Jaurès, before the beginning of the procession, let say 40 minute before. If you come at the beginning you may face a massive crowd, and it will be difficult to see all the parade in detail. If you have a car, don’t even think about finding a place to park downtown from 5pm onward. Course Camarguaise: Originated from the Camargue Area, the Course Camarguaise in French literally means “Camargue Race.” This is a traditional game that take place in the Arenas. 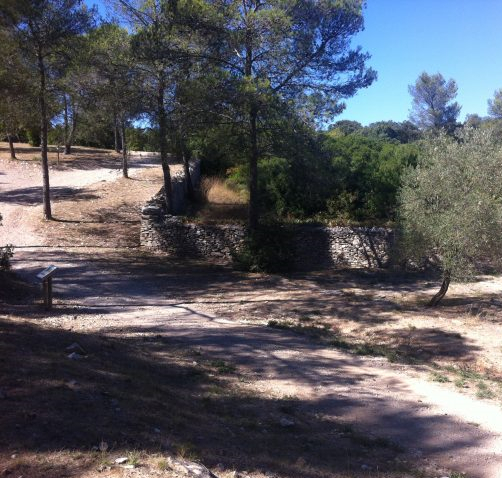 We can see the course camarguaises all along the year, in every cities and villages of the region where there is an arena. 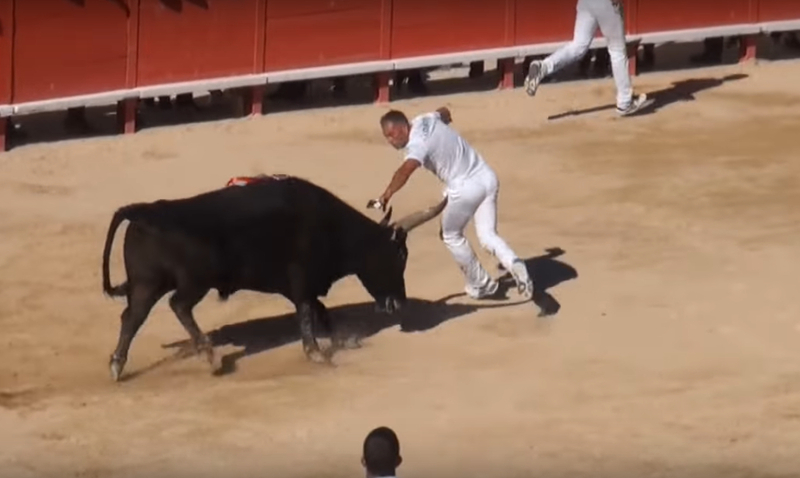 The participants, called “raseteurs”, are all wearing white shirts and pants, and they play a game which basically consist of trying to remove a string attached between and on the horns of the bull, with the help of a very small grip with tiny hooks. They get money donated by sponsors (often local companies) for each string they get. During the Feria the course camarguaise is traditionally held on Thursday at 6pm in the arenas. It is important to notice that usually the corrida of Monday morning is a Portuguese-style Corrida. Here the main star is not the torero but the “cavaleiro”. The Cavaleiro is a horseman who fight the bull from horseback. 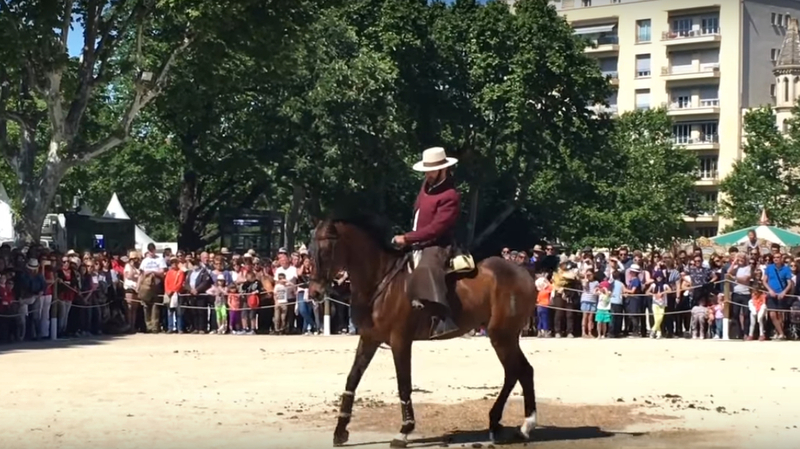 Traditionally the horses are Portuguese Horses train for bullfight. That being said, whether we like it or not, the corrida is an old local tradition and as such we have to respect it or just leave it. 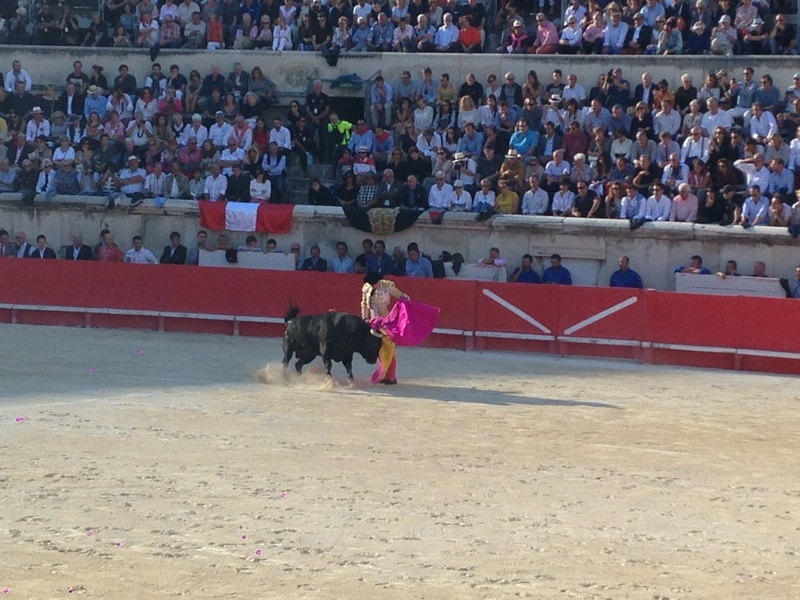 Corrida is the evidence of how the Spanish Culture is present in the region. It is important to notice that the bulls used for Corridas are only raised and selected for Corridas in places called ganaderias. The bulls can reach a weight of 600kg and they are selected for their killing instinct. Whoever their opponent is, they never give up a fight. Without the corridas, these kind of bulls would already had disappear from the Planet. 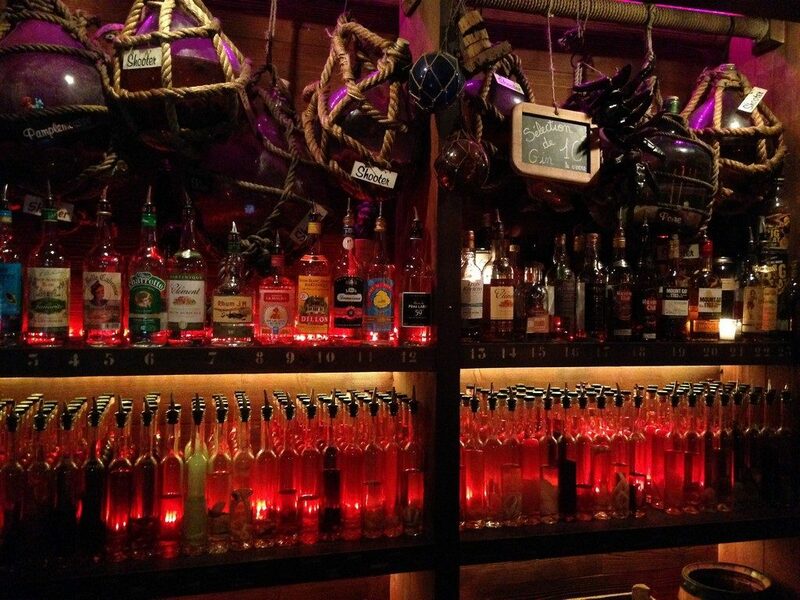 Bodega: Traditionally in Spain the Bodega is the time when the cellars are generously opened and wine and sangria makes its way through the masses, making a grandeur exhibition of outdoor bars. 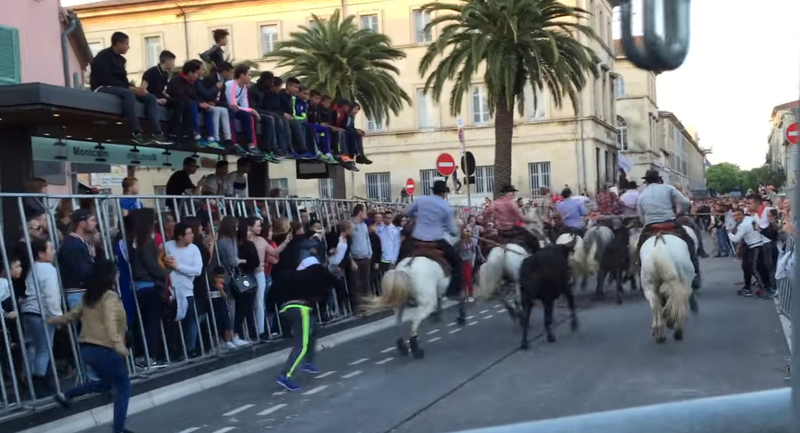 Here is one more evidence of how the Spanish Culture is present in the region of Nîmes. 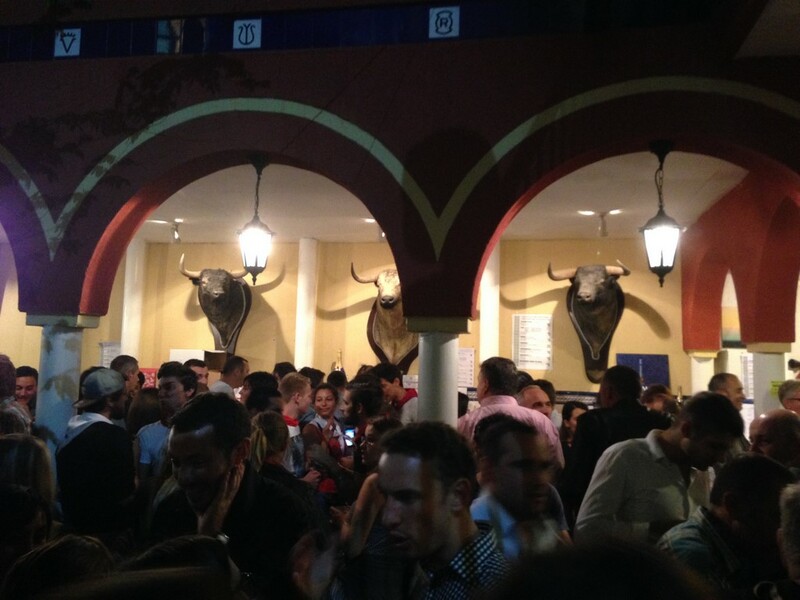 Therefore, several bars or pubs are during the feria turning into what we locally call bodegas. Even if they are not really the same as in Spain, they are not always cellars by definition but they are considered as a bodega by extending their bar right into the street. 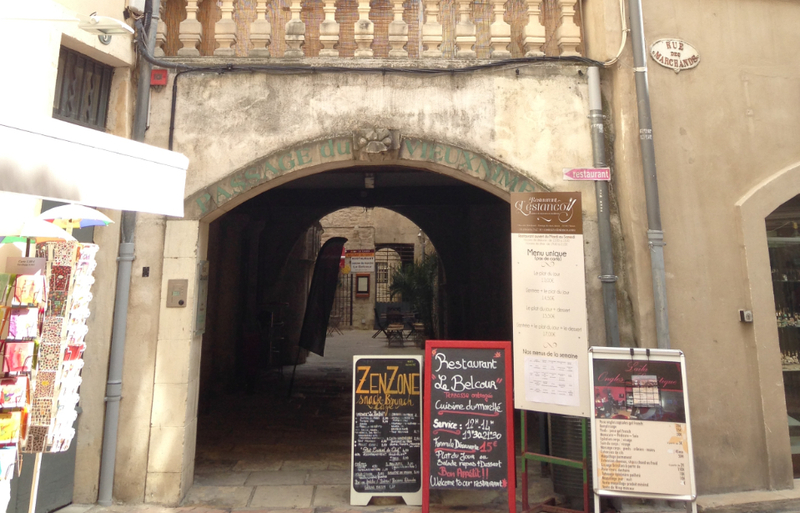 Most drinks are served in the bodegas, especially the 2 unavoidable local drinks: Pastis and Sangria. Sangria, is one of the very local specialties in Nîmes and you will find this refreshing fruity drink quite everywhere during the Feria. You will also notice that an effort has been made over the last years to increase the use of returnable glasses and avoid the daily rubbish mess traditionally caused by all amount of glasses thrown all over the floor. So if you order a drink, most of the time you will get a plastic glass for just 1 euro, that you are supposed to keep along-side with you. You can give it back to the barman who will refund you back your money. 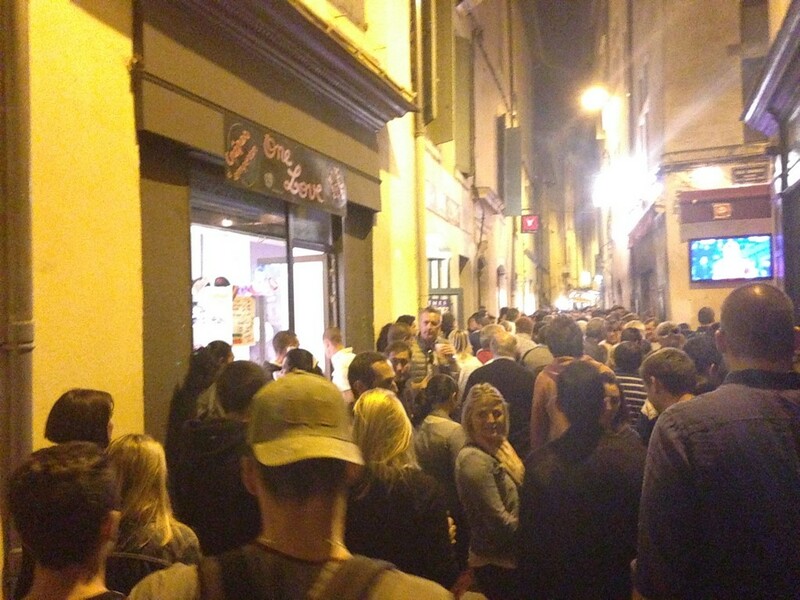 Another great, crowded and crazy bodega is the Le Prolé, located 20, Rue Jean Reboul, nearby the arena. This outdoor-patio style bodega is quite a good choice. It is a cool and easy place where you will meet people from quite very different backgrounds. Abrivado: Originated from the Camargue region Abrivado is one of the most popular traditional event. Horse riders hammer and gallop through the grounds of the streets making a spectacular sight for the spectators. Abrivado can be seen as a kind of skill test in which the guardians (the horse riders) are tested to imprison the bulls and denying them any chance to escape, as they have to bring the bulls from a point to another, often from a truck to the arenas. This traditional game can be quite dangerous so safety barriers are set up along the streets to avoid the bulls to escape. I suggest you to stay behind these barriers unless you are familiar with bulls and this kind of games. Along the way the guardians have to avoid the attrapaïres, in provencal language it means the people who try to make the bull escaping from the parkour. It often leads to a lot of tensions, fun and emotion especially when the bull pass through the barriers or is being stopped and catch. It is interesting to notice that the bulls used for the abrivado and the courses camarguaises are bulls from camargue. They are different from the bulls used for corridas. Bulls from camargue (“Taureaux de camargues” in French) are lighter, and they are whiling to “play” with the people staying around. At the opposite, the bulls for corridas are not willing to play at all, they just want nothing but to quickly kill anybody who stay on their sight. Therefore, don’t be afraid so much of the abrivado, it is fun to watch as long as you respect the safety rules, which are basically to stay behind the safety barriers. The Abrivados, in Nîmes usually take place in Rue de la République, often around 8pm, after the end of the corrida, located just next door at the Arenas. Pena: Penas are small bands that perform on the boulevards and streets, entertaining people with their traditional tunes. They often play paso doble but they can also play any other kind of lively music. The Penas are moving all over the city, so you can find different penas in different streets and boulevards. If you want to have all chance to see Penas, it is suggested to go to the Boulevard Victor Hugo, the Esplanade Charles De Gaulles, the Place de la Maison Carrée or the Place des Arènes. You can also find penas in some bodegas. 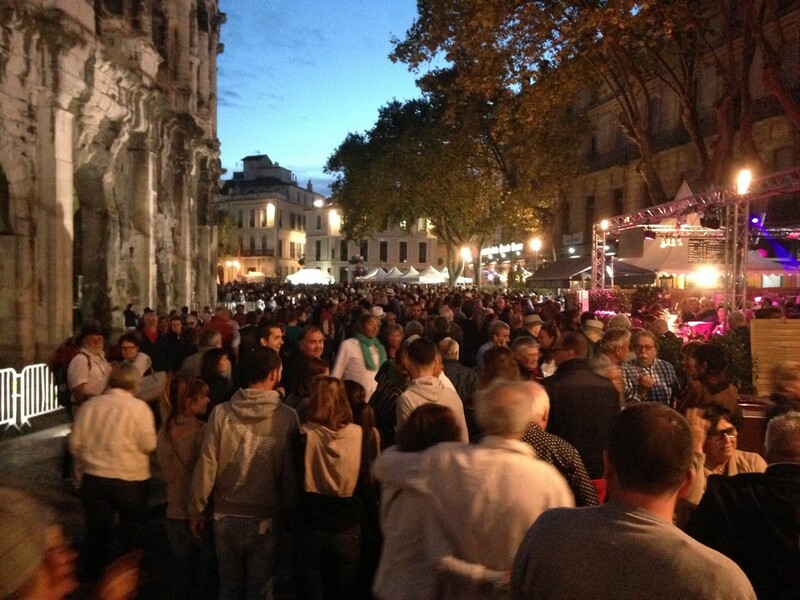 Flamenco: Nîmes is well-known for holding several time per year Flamenco concerts especially during the Ferias. Flamenco performances are taking place in many areas of the city especially in La Placette, the Place de Arènes and the Esplanade Charles de Gaulle. Nîmes has garnered an excellent reputation in recent years for regularly holding Flaminco performances with the best artists coming straight ahead from Spain. 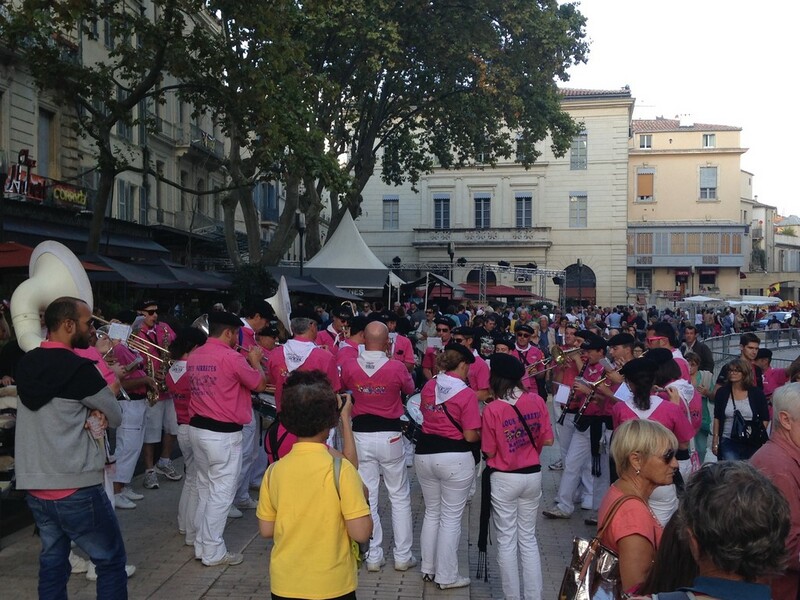 Joutes: Originated from the Island of Sète and its region in the 12th century, the joutes take place on the water. It consist of two big rowing boats with a raised ladder at one end, each boat have 10 rowers who propel the boats towards each other… on each ladder 5 jousters are standing up. When the boats closely cross each other, the jousters at the top of the ladder try to dislodge each the other from their platform with the help of a shield and jousting pole. On board, a music is played by a band made of drummer, piper and oboist for the rowers to follow a beat. This traditional water sport is something one must watch once in his life. 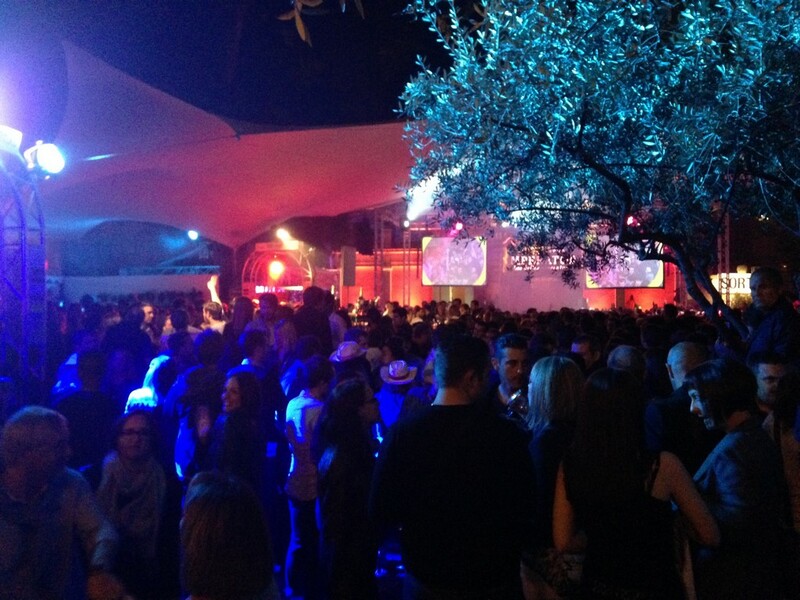 During the Feria, the Joutes take place on Monday morning around 10.30am in the canal of the Jardin de la Fontaine. Come early if you want to get a seat! 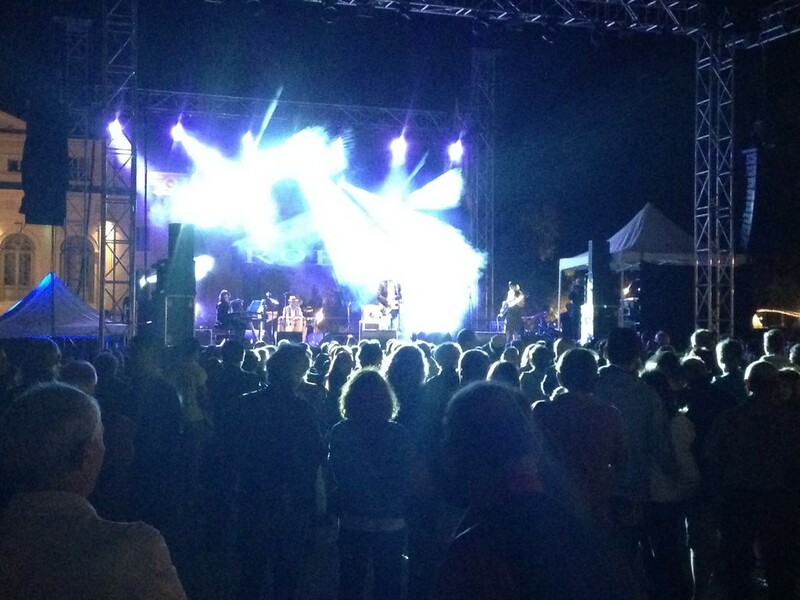 Music concerts: Music Concert of all sort from pop music to techno music are held during the Feria, day and night time. Most of them are located Place de la Maison Carrée, Place des Arènes, La Placette (often popular and gipsy style music) and place de l’Horloge. The rouille: Served as a garnish with fish, fish soup and bouillabaisse, the rouille is a sauce originated from Provence and made with, garlic (loaaaaads of garlic), olive oil with breadcrumbs, saffron and cayenne pepper. It has a very strong smelt yet pleasant of garlic. The tapenade: a local puree made of black or green olives, garlic, anchovies, capers and a twist of lemon! Just spread it on bread and eat it with a glass of pastis! 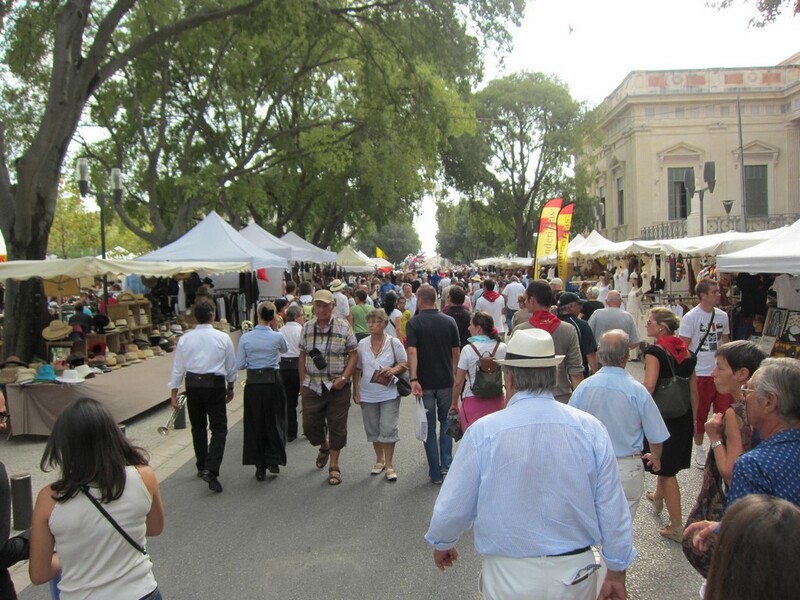 A walk in the streets: Sounds pretty basic, but here you are… just have a walk in the streets of Nîmes during the Feria and feel the vibes of this exciting city. Take the time to hear, smelt and listen. Live like the local, let it go the time of a night or more. There is so many things to do within the same place that you couldn’t see everything from the morning until dawn and this is what makes the Feria a magic moment close to an out-of-the-world experience.